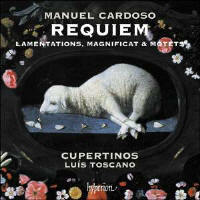 It’s more than 20 years since a clutch of recordings put Cardoso on the map, including one of his six-voice Requiem by The Tallis Scholars (Gimell, 10/90), a Mass and motet recital by The Sixteen (Coro, 8/94), and another from Philippe Herreweghe’s Ensemble Vocal Européen (Harmonia Mundi, 5/97). Though not as opulent as its more richly scored companion, his four-voice Requiem is a compelling work, especially when sung with this degree of commitment. It’s a quality that shines throughout the recording. The selection of motets is very satisfying: Cardoso is as adept in plainchant-based works as in freely composed ones. The well-known Sitivit anima mea is as compelling as ever. That said, a couple more extrovert pieces might have helped showcase this ensemble’s skills more fully. This is the first recording by Cupertinos for Hyperion and it is a pleasure to have a Portuguese ensemble tackle its native repertory. The sound is bright and privileges the higher voices, the lower ones being light baritones rather than basses. The timbre of the female altos, especially in their lower register, isn’t quite familiar from other continental ensembles or English ones. This could do with a touch more polish, though one wouldn’t want to lose the slightly acidulated quality, for it adds something distinctive to the mix. Cardoso’s penchant for chromatic touches is well known, but those false relations require gimlet-like precision, which isn’t always the case here. 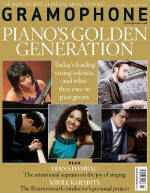 But I look forward to hearing more from them soon: Cardoso’s music deserves further exposure.